This past Sunday, Circle of Fountains had their official 2017 planning meeting. This planning meeting is part of my responsibilities to the group as Circle Coordinator, and it's a job I don't take lightly. In one single meeting, we have the majority of our year planned out, with assignments, responsibilities and dates for rituals, classes and meetings. However, as I planned it, it came to my attention that many organizers of covens, groves or circles - whether they're called Coordinators or High Priest/esses or what-have-you - struggle to find a definitive way of organizing their group. 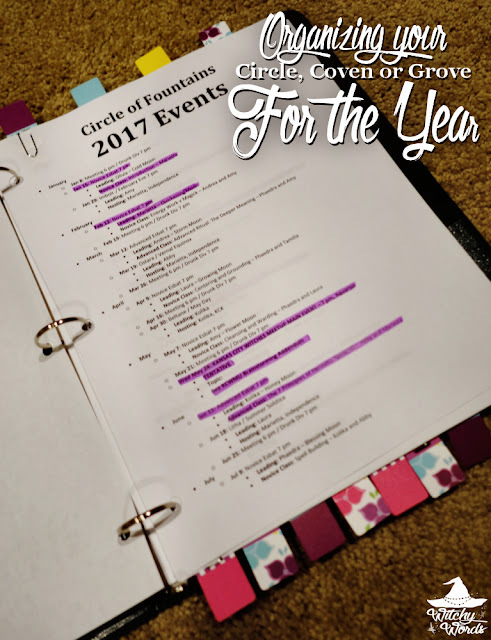 With this article, I will walk you step-by-step through how I planned for and organized our 2017 year in conjunction with my circle. It may seem like a lot up front, but it's so worth it to help your group run smoothly during the rest of the year. Above is a picture from our divination night held directly after our 2017 planning meeting. It gives you a general idea of how many people our circle entails. We have eight Primary Members; these members have responsibilities directly to the circle. They lead at least one sabbat and one full moon esbat, teach a minimum of two novice classes a year and participate in the facilitation of public rituals and classes through planning meetings. They also hold an office to the circle that helps keep us organized. You can read more about the offices here, though they are not officially updated for the 2017 year just yet. We have three regularly-attending Associate Members. Associates are live-in significant others of Primary Members. Two of them actively participate in ritual and one takes the photos of our rituals. We have three Guest Members. Guests can facilitate ritual for the group if they so choose to do so but are generally welcome to attend ritual and events as they see fit. We also have three Novices for 2017. Novices are non-initiatory partial members who participate in full moon esbat classes to further their studies. Noviceship is one year long starting in January and ending in December, with acceptances for the following year happening in November. Overall, we have 17 regularly-involved people in our group. This is as big as we can and will get. Because Primary Members have responsibilities to the group and an active role in its formation and management, the 2017 planning meeting solely involved them. Oftentimes, we rarely start thinking about the new year until, well, the New Year. 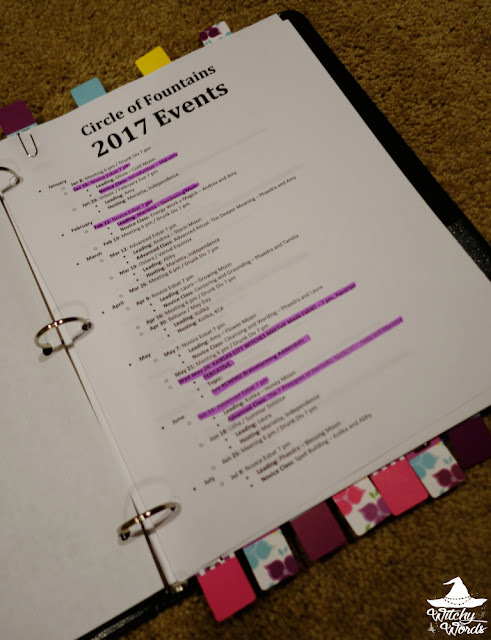 Unfortunately, the New Year is a bit too late to adequately get on top of planning for a circle, coven or grove, particularly if you operate similarly to how Circle of Fountains does. Our first full moon in 2017 is January 12th, and February Eve or Imbolc is just around the corner on February 1st. Because each Primary Member is assigned one sabbat and one full moon esbat to lead a year, this short-changes whomever has the first esbat or sabbat of a given year if you start planning too late. Circle of Fountains holds their 2017 planning meeting in November. It tends to be a usually easy-going month for us, plus it gives our first ritual leaders a two to three month head-start on ritual planning. My circle has a "Business Chat" for circle-related discussions. 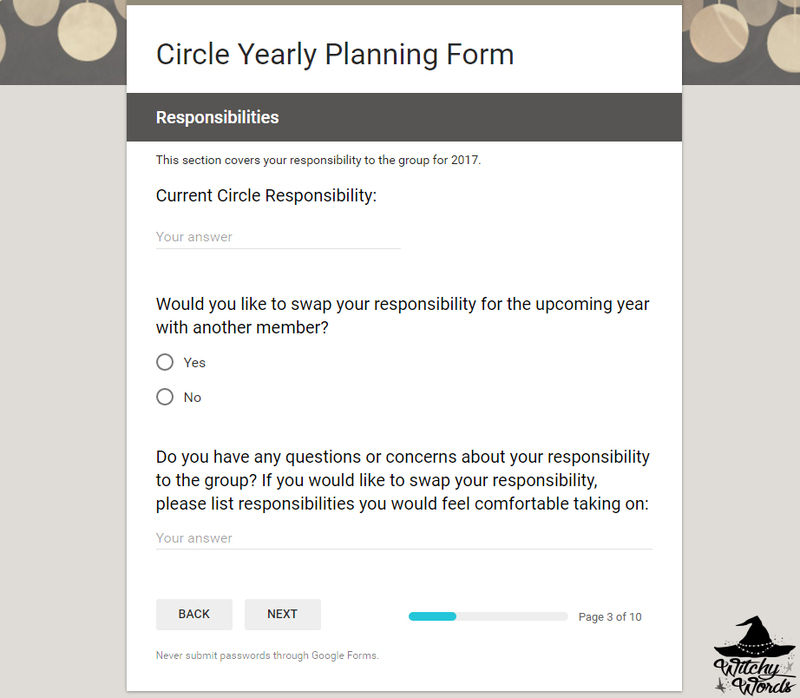 Over the year, as we discussed ideas for 2017, I threw them into a form on Google Forms. Google Forms is a lifesaver when you're trying to collect information. It's incredibly user-friendly and I highly recommend it. Continued Membership: This allowed any Primary Members looking to step down to Guest Member to discretely make their needs aware. Responsibilities: Any member needing to exchange responsibilities or make new suggestions was given the space needed to do so here. Sabbat Rituals: Every year, I ask each member to give me three sabbats they would like to lead in order of most to least wanted. I then sort sabbats based on these responses. I also asked about ritual hosting, sabbat fees, pot luck changes and preferred sabbat activities and ritual components. THis gave me a full view of what our circle members want out of CF sabbats. Training and Esbats: Our full moon esbats have been pretty open ended in the past: We open the circle, call the quarters, and then release everyone to do their own activities. Then, two Primary Members and the Novices sit down in a corner of the room and go through one of the assigned classes. In this section of the form, I was able to ask Primary Members what Novice classes they would like to teach this year and what esbats they would like to lead. I also introduced the idea of having four Advanced Classes for primary and guest members. These advanced classes would further the education of our members who are past the 101 and 201 of Witchcraft and paganism. Members were able to suggest topics they want to learn about and would be given three months to prepare for presentation. Public Rituals: This section covered brainstorming and suggestions for public rituals for CF. Public Classes: CF is striving to teach two public classes this year. This section covered topic brainstorming for those two public classes. Public Event: In the event that we are unable to lead a public ritual through one of the local organizations, CF would like to put on their own event. This space allotted brainstorming for that. Witchy Words: CF Primary Members filled out a short informational survey for their profile on Witchy Words and volunteered for optional guest articles. Suggestion Box: Exactly what it sounds like. Google Forms compiles answers into a handy group and individual view. It let me see what most people needed in pie charts and boxed suggestions into an organized list. Suggestions are easy to keep tabs on and the pie charts sort selected answers, but how do you assign things like sabbats that come in order of preference? I would suggest doing something like above. The darker the box, the higher on the list their preference was. If someone said "any sabbat" or "any but these sabbats," I highlighted all possible sabbats with the lightest shading. 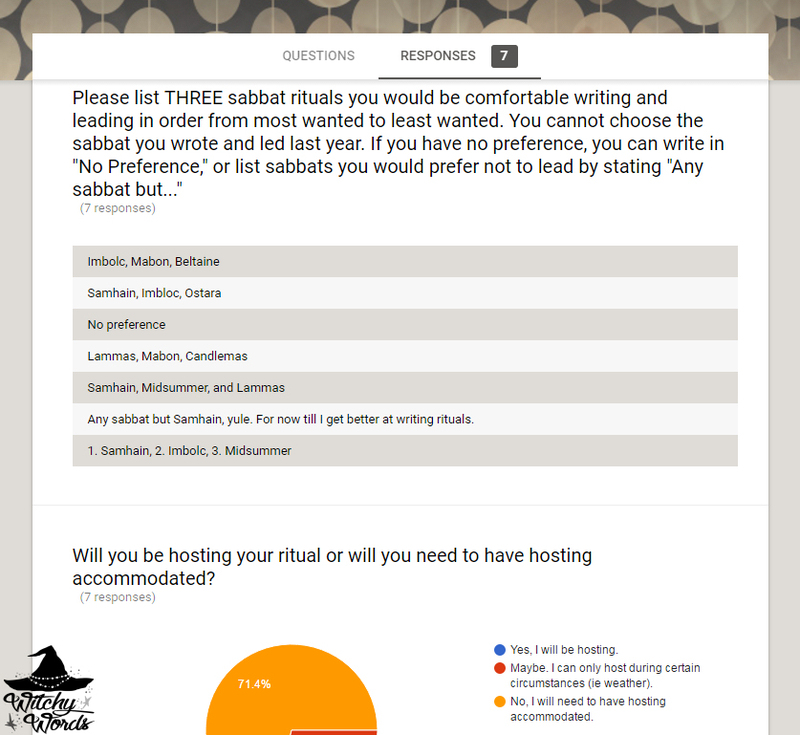 I left my selection completely unmarked because I had decided in advance that I would take the sabbat least requested. Sorting these still took finesse. The easiest to place was Midwinter / Yule. No one specifically asked for it so I took it. I then jumped to the hardest: Samhain. Three people specifically requested Samhain as their most-wanted sabbat. I literally drew a name from a hat and ended up with Phaedra. Tamilia wanted August Eve / Lammas more than anyone else did, so I gave it to her and Laura wanted Midsummer / Litha more than anyone else, so it was hers. At that point Amy had to have February Eve / Imbolc or she wouldn't get one she wanted. That left Kolika with May Day / Beltane or she wouldn't get one she wanted. That left me with the equinoxes and our two members who had no strict preference. Once again, I pulled a name from a hat. 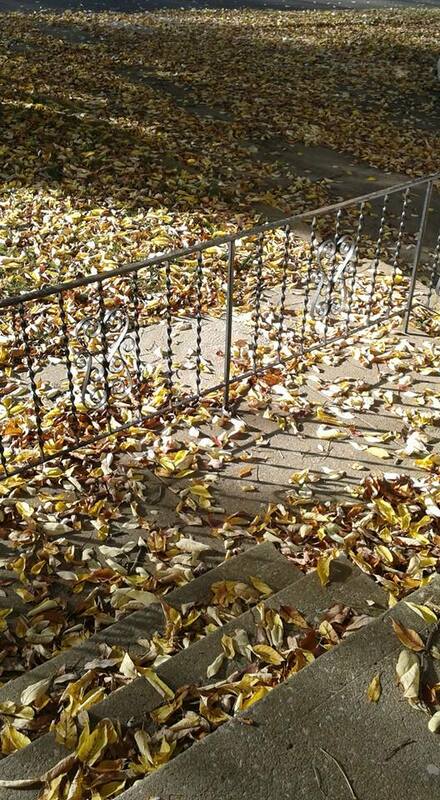 Sabbats were the first step. I also had to assign Novice classes, Advanced classes and full moon esbat rituals. I followed a similar process for Novice classes as above. I then looked at advanced classes. Some members had suggestions and some didn't. I ran with suggestions that were either repeated across members or would certainly be considered advanced. Abby suggested the seven principles of hermetic witchcraft. That's something I'm comfortable with as well, so we're together on that. Both Kolika and Andrea suggested Advanced Herbalism, so they both were assigned that. Phaedra suggested Advanced Ritual: A Deeper Meaning and Amy was interested in it when I contacted her about it. Then Tamilia suggested deity aspecting and Laura liked the idea, so they got that. As I worked to compile our potential schedule, I talked with members as a group and individually to see what they were interested in or comfortable with. I looked at their preferred months for novice classes and esbats and their preferred sabbats. I attempted to not assign them too much in one single month. No member running a Novice class had to also lead the full moon esbat it was being taught under. It took a lot of working and reworking until I finally felt like everyone would be comfortable with the list. Once I had everything sorted, it was time to compile it. Of course, this meant a trip to the store to collect supplies. 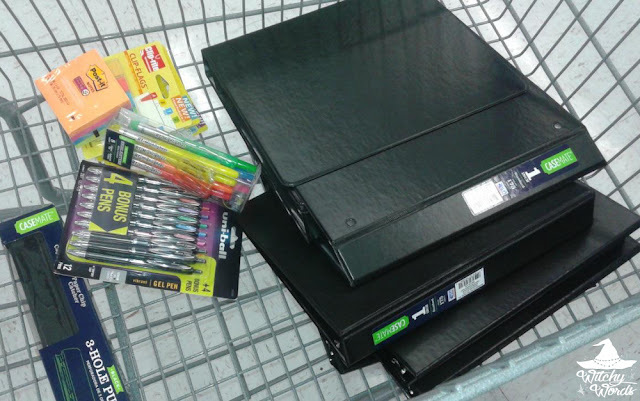 I grabbed eight black binders - one for each member, pens, highlighters, post-its, paperclip tabs to help them find sections and a hole punch. When each Primary Member arrived, they took a hole-punched sheet with their name on it and a binder. They also took a pen and a highlighter. Post-its and bookmarking tabs were on trays on the coffee table. The sheet with their name on it would label their binder as theirs so we don't get them confused at later times. 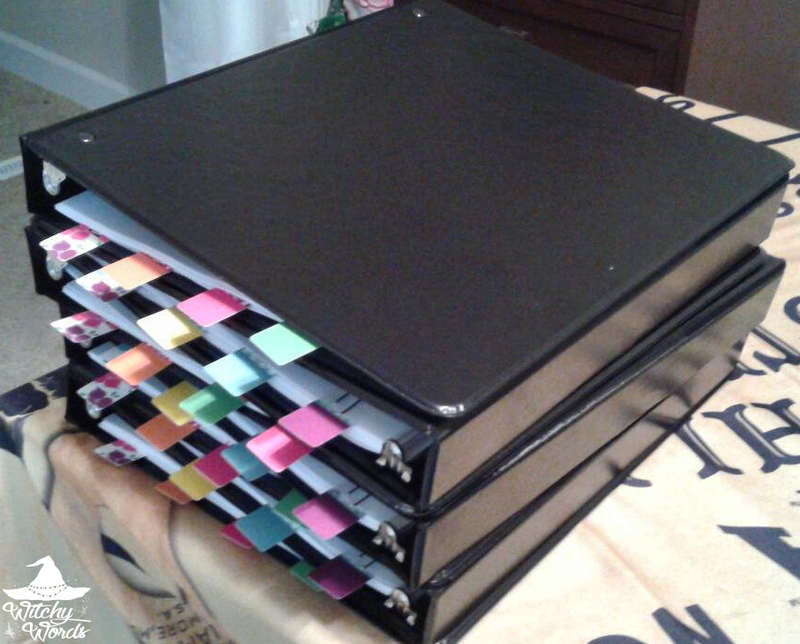 Each binder has four tabs at the top to designate the four sections. The first section of the binder lists each event and tentative event for the year in order. 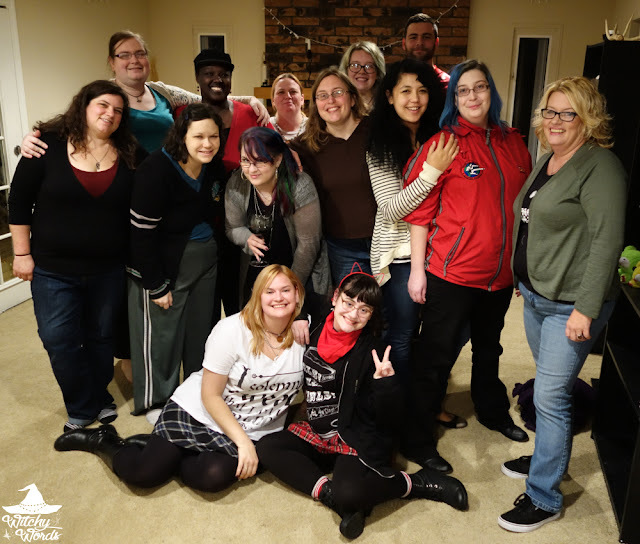 Members were asked to highlight events they had specific responsibilities to: A sabbat or full moon esbat they were leading or a Novice or Advanced class they were teaching. The next twelve pages are a full calendar. Members were encouraged to move the top tab to the current month as we navigated throughout the year. As we went through the calendar, Primary Members highlighted events where they had responsibilities once again. They also bookmarked it with a paperclip tab on the opposite side of the section tabs. For example, on this month, I'm teaching the Introduction class for the Novices. I placed a tab on this month to remind myself that I have that coming up and can easily find it when the binder is closed. The next section includes all addendums. Some are brain storming addendums for classes, rituals or events. Brian storming pages followed the format we used for planning a public ritual this past year. You can read more about that here. Other addendums are simply volunteer sign-up sheets. For example, at this year's Pagan Pride Day, we'll be hosting an informational table. I need two people at the table at all times. I will be there the whole day, so I'm asking three people to sign up for time blocks. As you can see above, Laura already signed up for the first one during our meeting. The last section includes a current, updated version of our Rules and Regulations. Each time we make major updates, I will print out new copies for each person to add into their binder. Of course, members can add extra pages as needed, particularly to the brainstorming areas. These binders are theirs to use how they need. At the end of our 2017 planning meeting this past Sunday, each member was assigned their full responsibilities for the year. Primaries walked out with a binder that summarized the sabbat and full moon esbat they were assigned, their two Novice classes and one Advanced class they would be teaching, and all planning meetings. Because we do everything on Sunday nights, the planners included the actual dates and technical dates for each sabbat and full moon, as well as birthdays for each of the Primary Members. 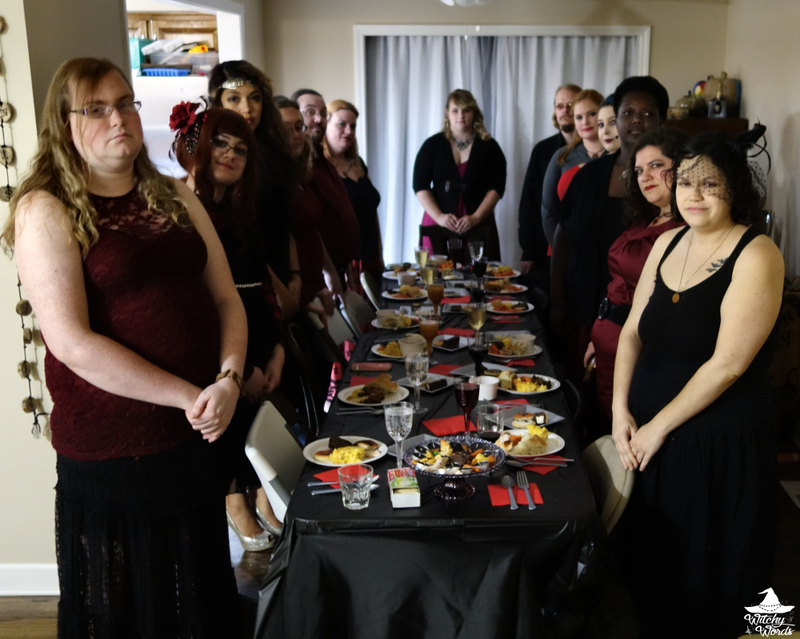 Under the Rules and Regulations, each member had an outline for their responsibilities and code of conduct, as well as what would be expected of them for sabbats, esbats, classes and public events. While this may all look like a lot to take on, we still only meet two to three Sundays a month and Primary Members are expected to contribute only 3-5 hours outside of those meetings each month. The circle is a large part of our life but it certainly shouldn't overtake career, family or health. Naturally, how we organize our year is based on how our circle runs. Not every circle, coven or grove splits up sabbats to individual responsibilities, teaches Novices, has Advanced classes or participates in public events. That being said, I hope displaying how we plan our year helps you plan yours! Good luck! 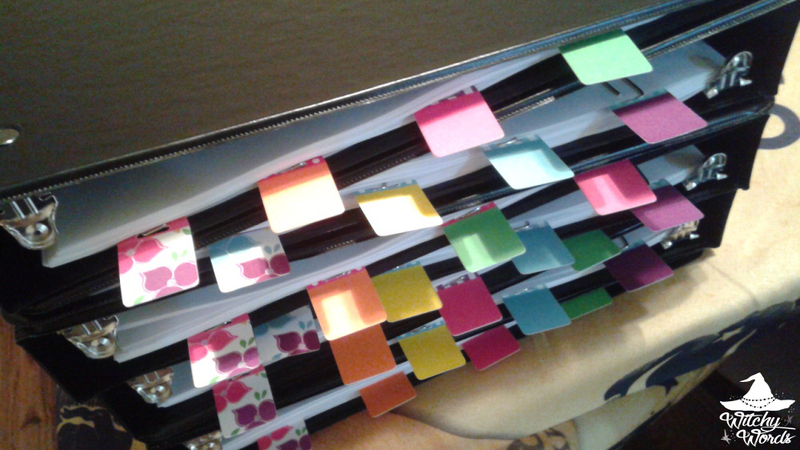 Oh, the Virgo in me LOVES this kind of organization! But also as a member of the greater pagan community, I think it is forethought and excellent advance planning like this that makes for successful circle, groves, covens, etc! As a Virgo, thank you! I truly appreciate it! Thank you for this article. My coven will certainly take a look on these tips and we'll do our own. Thank you so much, Ana! Best wishes to you and your coven!